Luxury car brand Infiniti has surprised customers this Valentine's Day with bouquets of flowers delivered to their door. The stunt is part of a Valentine’s Day campaign for the flagship Infiniti Q60 Sports Coupé created by TMW Unlimited. The campaign also features a film that will play out on screens in Westfield centres, where Infiniti has pop-up stores, and across Infiniti’s social channels. 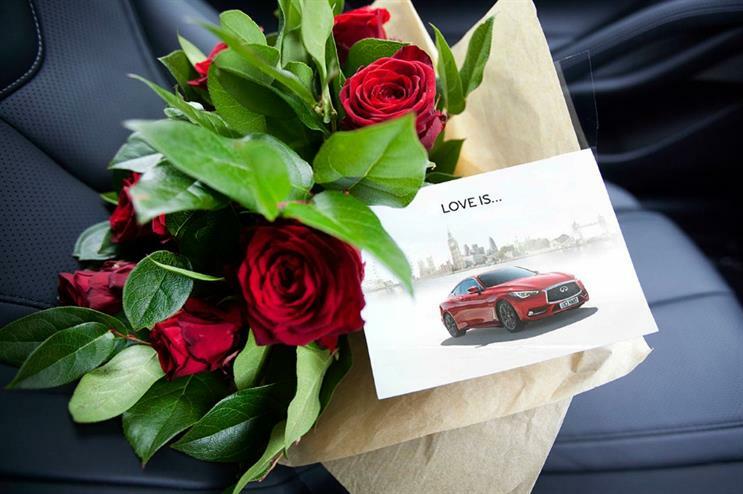 The film, titled 'Love is…in the detail’, uses macro shots to draw out parallels between the detailing in the Q60 and a handcrafted bouquet of roses. Viewers will then see a bouquet chauffeured in the Infiniti Q60 to the door of an unsuspecting customer. As well as 30 and 60-second versions of the ad, the campaign will also include outdoor ads and launches on Valentine’s Day. Sandra Subacius, digital marketing manager at Infiniti, said: "At Infiniti we are proud of the craftsmanship that goes into every detail of our cars, so it was a good fit to highlight the parallels with the preparation of the flower designs, and of course, the opportunity to delight our customers with a small token in Valentine’s Day. The video was a great way of sharing this across all our markets with a simple message and beautiful imagery."